Globe Telecom launched Globe Studios and Globe Live, which are designed to produce original shows, live events, and engaging world-class content that are fit for today’s discerning customers. At the same time, Globe revealed the line-up of its new international content partners and improved broadband plans for a complete and immersive entertainment lifestyle. 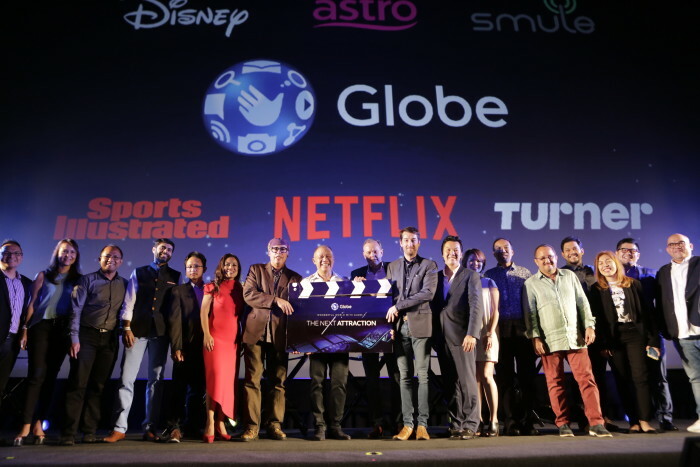 Globe announced that it is the first mobile and broadband Philippine partner of video streaming service Netflix which boasts of over 81 million members in over 190 countries who are enjoying more than 125 million hours of TV shows and movies per day, including original series, documentaries and feature films. Members can watch as much as they want, anytime, anywhere, on nearly any internet-connected screen. Netflix will be available to Globe customers via their mobile or broadband service. Dialing up the fun for Globe customers is Cartoon Network, this year’s current number 5 channel across all genres in the Philippines. Apps created by the Turner-owned brand will soon be available including an upgraded and authenticated version of Cartoon Network Watch and Play and Cartoon Network Anything. They both host a stack of engaging content from well-loved cartoons such as Adventure Time, The Amazing World of Gumball, Ben 10, The Powerpuff Girls, and We Bare Bears. For the first time in the Philippines, a live stream of the channel will be exclusively available to a non-TV audience. The apps also offer a selection of awesome video clips and interactive games and activities to keep the whole family entertained. Milkmoney develops content for brands including Red Bull, Disney Channel, Sony, Destination NSW, Diageo, Mastercard and Hyundai. ..